Samir Nasri has stated his desire to win trophies with Arsenal and stated: "I'm not expecting to leave the club without one." The Frenchman has been the Gunners stand out player this season, coming back from injury on Wednesday night to set up Arsenal's winner in their 2-1 victory over Barcelona. 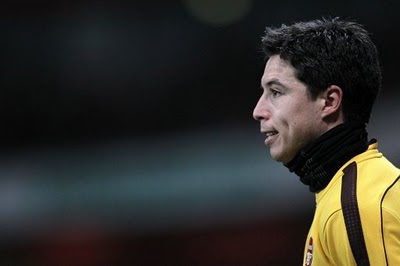 The midfielder is to the final 16 months of his contract with the north London side, with Arsene Wenger confident Nasri will put pen to paper in the summer. "One of the reasons I came to Arsenal was to win titles, and I'm not expecting to leave the club without one. "We want to win all the titles and prove we are the best team here."